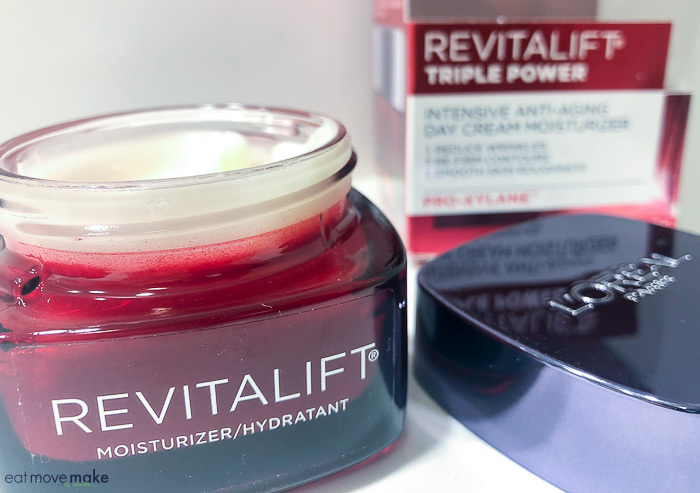 I took the L’Oreal Paris Revitalift Triple Power two-week challenge as part of a sponsored activation, but as always, my opinions of the product are solely my own. I gave myself an early Christmas gift this year by treating my skin to some serious hydration. Between the dry winter heat and the ticking of time, I figure I deserved it. Actually, I feel like I’m aging pretty gracefully, but when I look in the mirror and see changes in my skin, I can’t help but wince. Those fine lines are maddening! I’m grateful the fine lines are still fine lines and not deep-set wrinkles, and believe me, I’m gonna put up a fight to keep it that way for as long as I can. I’ve got genetics on my side, I never sunbathe, I always wear sunscreen and I treat my face with lots of TLC. And now this: L’Oreal Paris Revitalift Triple Power. 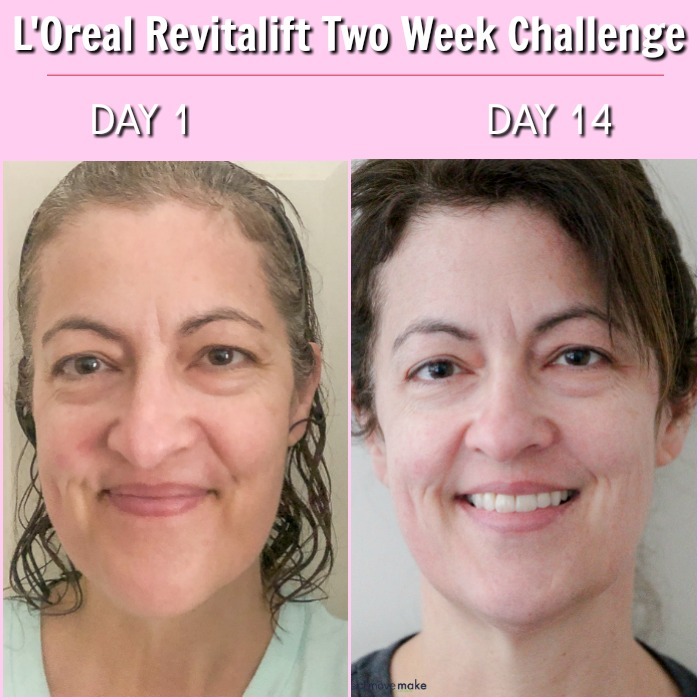 L’Oreal Paris is inviting all U.S. women to take the Revitalift Challenge for 14 days, and I couldn’t resist. Product Claim: Immediately, skin is hydrated. In 14 days, skin is visibly firmer & wrinkles are visibly reduced. And, they’re so sure we’ll all see results that they’re backing it with a **money back guarantee. 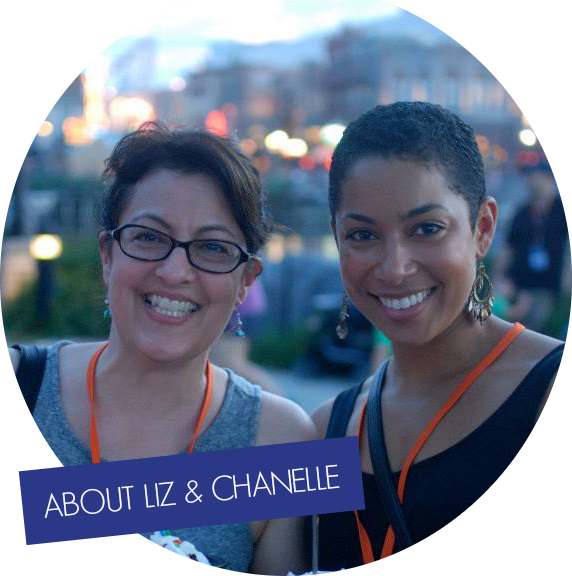 Before the challenge, I’d been trying different anti-aging skin care regimens and flitting from product to product. It wasn’t until I agreed to take the L’Oreal Paris Triple Power two-week challenge that I realized I hadn’t been tracking results from anything specific to see if it was or wasn’t working. So here’s how my two-week challenge played out. I took a photo of my face on day one (sans make-up–yikes!) so I could see if any changes, improvements or failures took place and then I began the challenge. 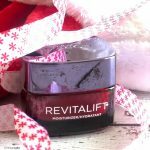 Every morning after a shower and every evening before bed, I smoothed L’Oreal Revitalift Triple Power moisturizer over my face, jaw and neck. It’s a really creamy moisturizer and spreads easily, so I didn’t have to use much each time. I continued the routine for 14 straight days (and in fact, am still using the moisturizer post-challenge), but on day 14 I took another photo to compare. I know it’s kinda hard to see the changes in the photos, but you can really see a difference in person. I think you can tell the skin looks more alive and vibrant now though. About a week in, I felt as if my fine lines had smoothed out and my crow’s feet were a little more plumped, so that if I wasn’t smiling, those smile lines weren’t visible at all. I’m a big fan of that. And at the day fourteen mark, my skin felt fantastic (and still does). I’ve completely lost that sensation of “pulling” you get from dry skin. I just feel hydrated, soft and luminous. I’m very happy (which is why I’ve continued to use the product to this day). I would absolutely recommend L’Oreal Paris Revitalift Triple Power. It thoroughly hydrated my face and rejuvenated my skin’s appearance. And that’s a gift every woman wants. Join me and take the #RevitaliftChallenge! Stop into your local Walmart store to purchase L’Oreal Paris Revitalift Triple Power day cream! **Money back guarantee, up to $24.99 (sales tax will not be refunded). Restrictions apply. For details, call 1-800-630-5585.Valid in the 50 U.S/D.C. and only on purchase of a RevitaLift Triple Power skin care product made between 1/1/18 and 12/31/18 with original store receipt. Request must be postmarked by 1/29/2019 and received by 2/12/2019.Void where prohibited. Limit 1 refund per person and per household. What kind of skin shenanigans are attacking me? I took this photo using the My Own app on my cell phone, and the number of fine lines I have on my face scared the ever-livin’ dixie out of me. 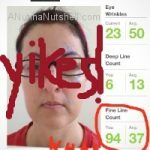 Crows feet, deep lines, spots, and pigmentation – all good numbers, but dude! My fine line count is ridiculous. What’s up with my tiny wrinks? Granted, I’m not getting any younger, (and for the record, neither are you.) But dang. So that’s kinda what led me to the Own Renewing Anti-Aging Skin Care Line. So restorations and reparations are underway over here using all the magical potions at my disposal. Every drip and drop of them! 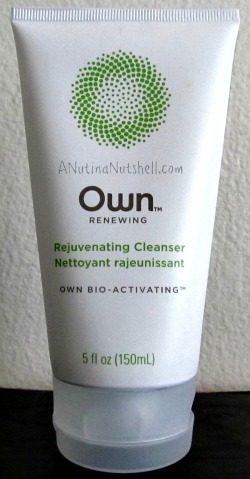 I washy-washy morning and evening with the Rejuvenating Cleanser ($12). It’s a very gentle cleanser with a subtle green tea scent which I love. It doesn’t really work into much of a lather, but it does a terrific job of washing off my makeup and whatnot. I love it. After I cleanse and while my skin is still moist (hate that word), I put several drops of the Firming Silk Concentrate ($24.99) on my face and neck. It’s a serum, and it makes my skin feel velvety smooth and really locks in the moisture. I absolutely love it, aside from the dropper bottle design. I constantly worry that I’m going to bump it over and spill it. 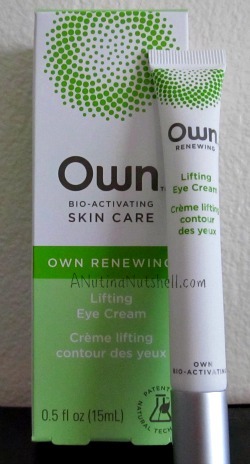 I also dab on a little bit of the Lifting Eye Cream ($24) on the delicate skin around my eyes. There’s not that much in the tube which reminds me to use it sparingly and purposefully. It helps to reduce the look of wrinkles and lift and brighten the eye area, and I think it does a magical job of working with what I have. 🙂 It makes my skin feel smoother and look alive. 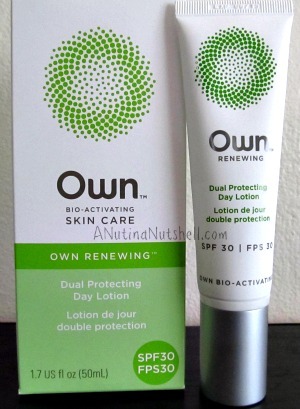 In the morning, I put this Dual Protecting Day Lotion ($23) with SPF 30 on my face and neck. It gives thorough but sheer coverage, and it absorbs quickly without leaving a residue. It does have a pump dispenser, but I must have depressed it 30+ times and it still didn’t work. I have to open up the container to get some out. Annoying. But I’ll still use it because I like it. Nighttime is when I set the potion in motion to really make up for all the nonsense I put my skin through in my waking hours. For my face and neck, I smooth on the Refining Moisture Night Cream ($24). It has that same subtle green tea scent, and it seems to improve the luminosity of my skin as it deep moisturizes. It has a very light, creamy and non-greasy formula. I’ve only been using my new elixirs for a couple of weeks, but so far I really do like the line, and I’m finally in the routine of remembering to use everything every day, so I hope that within the next month I’ll really notice some revitalization! 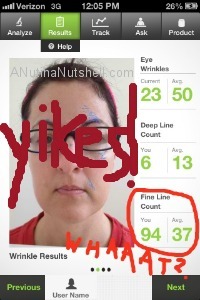 And then I’m gonna take another pic on that app and compare the fine line count. I’m still mad about that…. 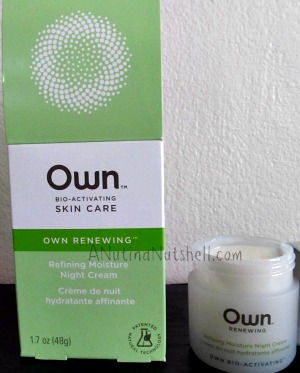 Check out My Own Renewing Skin Care for yourself! Products were provided, but all opinions are my own.